Holy frijoles – flames and death! Ok, not really. I thought this would be a better title than, “A Treatise on Solanum tuberosum,” the potato’s scientific name. After nearly 40 hashcapades, it occurred to me that I’ve seen just about every way to make a potato – boiled, deep-fat fried, pan fried, roasted and grilled. They’ve been mashed, diced, shredded, crumbled, and wedged. But, which potato makes the best hash and why? I should have an informed opinion right? The majority of my hashcapades at Chez Clark involve Yukon Gold potatoes for two important reasons: 1) I like the yellow flesh that spruces up the hash’s visual appeal; and 2) they hold a lot of moisture. Also, Yukon just sounds badass and hella cold, but that isn’t very scientific! Anyway, I decided to channel my inner geek and bought one each of the following potatoes: Yukon Gold, Red, Russet, and White. I’m ready to dig into this challenge! 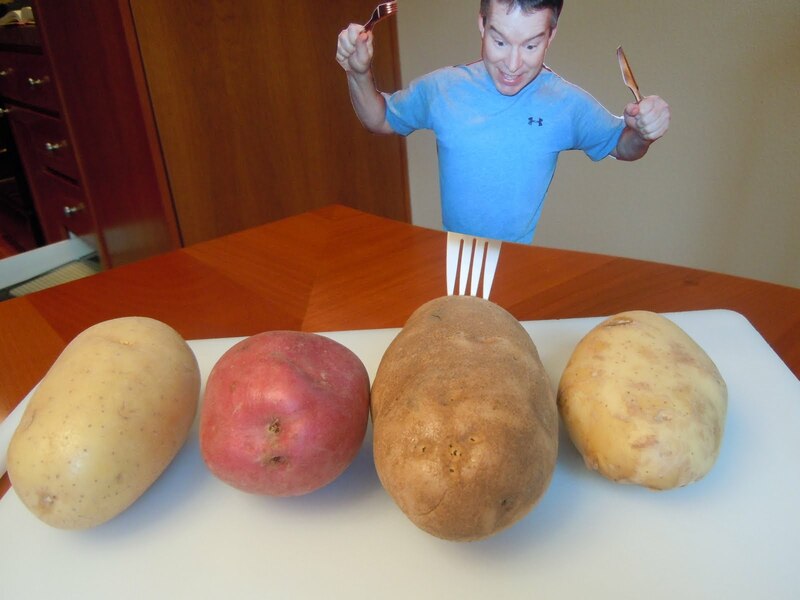 Of the cooking methods above, I had to decide which had the best chance of bringing out the best in all the taters. Most of the time, I pan fry raw, diced potatoes instead of previously roasted ones. For this experiment, I reasoned that roasting develops the more complex flavors. Next, I liberally doused olive oil and salt on the taters, covered them and baked them at 425 for 50 minutes. 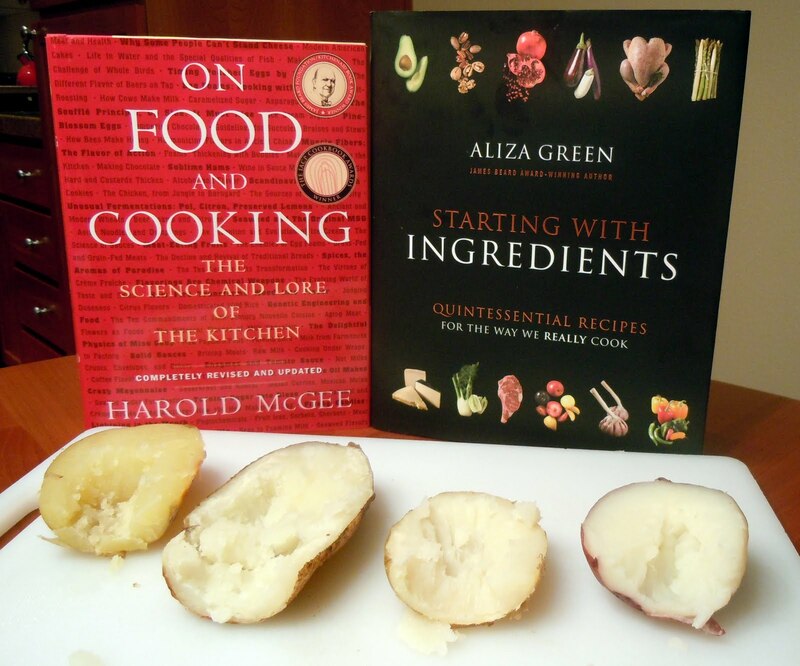 Whilst waiting, I consulted the bible, “On Food and Cooking: The Science and Lore of the Kitchen” by Harold McGee and “Starting with Ingredients: Quintessential Recipes for the Way We Really Cook” by Aliza Green. First sample after roasting and two reference books. Back to the post, please? Ok. But what about the next step in the process, frying up the hashed roasted taters? Using 1 Tbsp of grape seed oil, which is more neutral tasting than EVOO, I fried up the potatoes in two pans at a time – Dueling Flames of Death – on medium heat for 5 minutes, stirring every minute or so. Clockwise from upper left: Red, White, Yukon, Russet, post-roast & hashed. 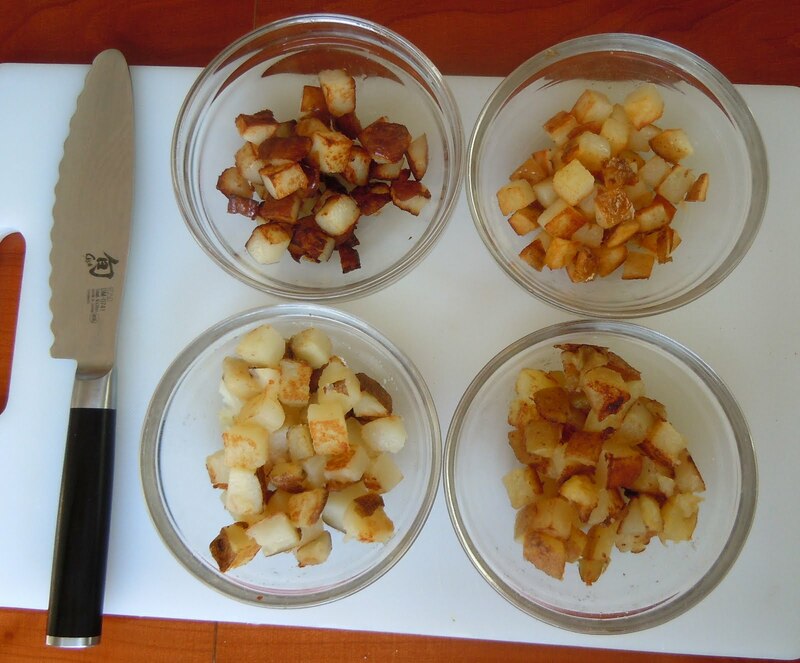 Clockwise from upper left: Red, White, Yukon, Russet, post pan frying. After frying, I felt vindicated by the Yukon Gold – it was a nice golden brown, still moist and more flavorful, but the texture was a little mushy. Surprisingly, the White tater dropped in the standings, tasting too much like a french fry and lacking the former roasted flavor, but firm – a tie with Yukon. Red browned nicely, but just didn’t do much for me. This left Russet as the winner – nice roasted flavor, firm texture, bold – but not as visually appealing as Yukon. Who knew my photo of mini-me on the Russet would actually show the winner of Dueling Flames of Death?!?! Sitting here creating this post, it occurred to me that a more subtle potato might be desirable if your ingredients are a little delicate, i.e. crab vs. corned beef. In that case, Russet may over-power the main attraction.What do you think? 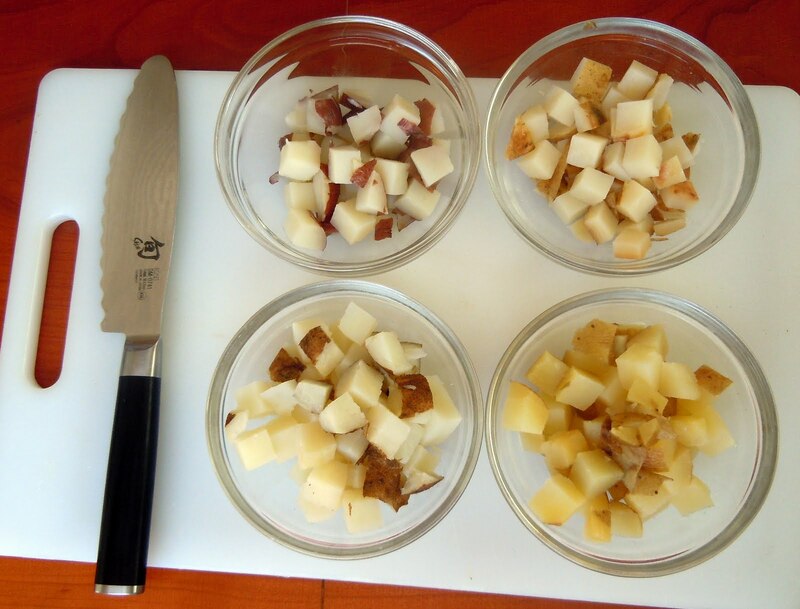 What’s your go-to tater and how do you prep it for a hashcapade? This entry was posted in Uncategorized by hashcapades. Bookmark the permalink.